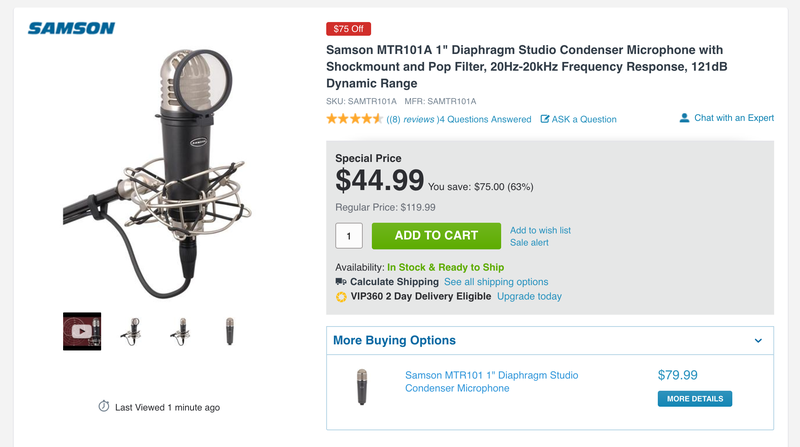 Adorama is once offering the Samson MTR101A 1-inch Diaphragm Studio Condenser Microphone with Shockmount and Pop Filter for $44.99 shipped. That’s more than $100 below the original listing, $15+ better than Amazon, matching our previous mention and the best we can find. Rated 4/5 stars on Amazon and Adorama. Samson’s MTR101A Studio Mic Kit brings exceptional performance and high-end quality to a variety of live and studio situations. Ideal for recording vocals, close miking instruments, use as a room microphone and more, the MTR101A (MTR101 Condenser Microphone, pop filter and shockmount included) solidifies, Samson’s commitment to offering superior sound and the ability to capture the best audio possible. The MTR101 is a large, 1-inch diaphragm studio condenser microphone. It features a cardioid pickup pattern that provides increased isolation of a sound source and is designed to handle high SPLs of up to 137dB. The MTR101 offers a smooth, extended frequency response, as well as low self-noise and a wide dynamic range perfect for recording. In addition, its rugged die cast construction features an internally shock-mounted capsule that reduces handling noise and external vibrations. In addition to the mic, the MTR101A kit includes a pop filter and shockmount. The pop filter features a stainless mesh screen that reduces vocal popping and sibilance. The filter is easily attached directly to the mic, and just as easily removed. The kit’s specifically designed shockmount provides the mic with enhanced isolation from mechanical noise, and is compatible with all standard microphone stands. The MTR101 is perfect for capturing vocal performances in the studio. The mic’s cardioid pickup pattern provides increased isolation, avoiding unwanted noise and highlighting only the vocalist. As such, the MTR101 is ideal for any vocal performance where excellent rear-rejection is needed or use it as the “Mid” mic in a Mid-Side stereo setup. And with a wide 20Hz–20kHz frequency response, the MTR101 can capture the most dynamic of voices with ease. In the early ’90s, Samson began to expand the reach of their audio products through the development of power amplifiers, mixers, wired microphones and signal processors. In 2005, the first professional USB microphones to be used by musicians, broadcasters and podcast enthusiasts were introduced, making Samson USB microphones the new industry standard. Over three decades, Samson has grown from a small two-person operation to a worldwide enterprise, dedicated to innovating new products that will enhance the lives of music and broadcast professionals everywhere.